Published: Dec. 26, 2016 at 01:45 p.m. Updated: Dec. 26, 2016 at 02:20 p.m. The Huskies are waking the echoes of Washington's early 1990s teams that competed for national championships. Head coach Chris Petersen has shown his success at Boise State was no fluke. He's led Washington to the College Football Playoff, where No. 4 UW will take on No. 1 Alabama in the Chick-fil-A Peach Bowl on Dec. 31. NFL scouts are lining up to see Washington's practices because of all the future pros on the roster. These 10 players will be cashing checks at the next level, and several have star potential. While UW DL Vita Vea has great feet for his size, Qualls is a guy who sticks out on film for his pure power. Offensive linemen have a hard time anchoring against him because he plays low and keeps his feet moving after contact. The junior will be a two-gap nose tackle at the next level, so his ability to get off blocks from Alabama's strong interior linemen will help his cause with scouts. As a sophomore, Gaskin crossed the 1,000-yard mark for the second time. The 5-foot-9, 192-pound speedy back is difficult for defenders to find in traffic; if they don't stop him behind the line, he'll accelerate into the open field. Scouts might not consider him a feature back at that size, but guys like Atlanta running back Devonta Freeman show how valuable a back like Gaskin can be. If Gaskin can run through or avoid tackles from Alabama studs like Reuben Foster, Tim Williams and Jonathan Allen, it would quiet any concerns about his ability to run tough at the next level. UW WR John Ross' speed is well-known among scouts, but Pettis' toughness and reliability are also worth noting. It's not like he's not fast or athletic himself, as his 14 scores have come from beating his man off the line and separating downfield. After the catch, Pettis is not easy for a smaller corner to bring down, as he smells and attacks the goal line. I can't wait to see him and Ross take on Alabama cornerbacks all over the field. Don't expect this junior linebacker to be intimidated by Alabama. Bierria plays with his hair on fire, using excellent speed and form tackling to bring down ball carriers. Most people outside of the West Coast haven't heard much about him, but scouts covering the area know him well. If the second-team All-Pac-12 pick makes plays against the Tide like he has against UW opponents all year, he could become a household name. The sophomore passer possesses a lot of the skills NFL scouts want in the leader of an offense. Browning is smart, athletic and a natural leader. If flushed out of the pocket, he will get the first down more often than not. His size and arm strength are average, which might limit his grades. But he's certainly capable of moving an NFL offense, and has arc and touch on his deep ball that lets his receivers make plays. Doing these things against the nation's best defense in Alabama will help him gain a lot of respect from NFL general managers. Jones is the star of the secondary, but King's length and footwork are also very intriguing to scouts. He gets plenty of chances to make plays with teams avoiding Jones, thus he leads the team with 13 pass breakups. King also has two interceptions this year, including a one-handed highlight-reel pick in the end zone that thrilled fans and scouts alike. Ball skills and size? That's a winning combination. 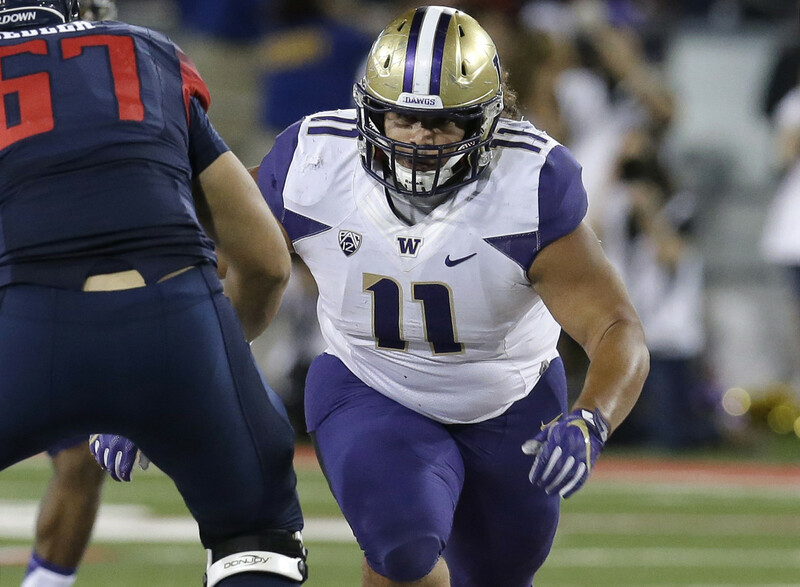 On a Washington defensive line that might be second to only Alabama in terms of strength and talent, Vea's combination of agility and power stands out. The redshirt sophomore moves like a 250-pound end instead of a 335-pound tackle, chasing quarterbacks out of the pocket and hustling downfield to the ball with regularity. In fact, he's a member of the team's punt-return-coverage unit, which is rare for a man his size. It won't be surprising if he has a Danny Shelton-type rise in the draft whenever he decides to enter it. Comparisons between Baker and Earl Thomas are natural due to Baker's size (5-10, 192) and playmaking ability. His play will be key to Washington's success in holding back Alabama's offense in their semi-final matchup. Baker will need to spy quarterback Jalen Hurts when he runs, as well as track tight end O.J. Howard and make secure tackles on short throws to receivers in coverage. Heady play and forceful hits against the favorites from Tuscaloosa will push him up draft boards all over the league. I think Jones is the best corner in the country in terms of pure coverage skills. He's a lean 6-0, 180 pounds but no other outside defender plays with more tenacity. Seeing Jones face Calvin Ridley and ArDarius Stewart will be a joy for scouts and football fans alike. And if outgoing Alabama offensive coordinator Lane Kiffin dials up screens and outside runs to Jones' side of the field, Jones will be involved in those as well. I'm not sure why he wasn't a Biletnikoff Award finalist, but Ross deserves to be known as one of the top receivers in college football (1,122 yards, 17 scores this season). Scouts drool over his speed and quickness, as he can win on any route his coaches send him on. Ross has only adequate size for the position (5-11, 190), but he can get off the jam and get into his route as well as any receiver in the country. He's facing some strong Alabama corners in the playoff, so it will be an excellent test of his physicality and hands.